WE ARE PLEASED TO ANNOUNCE THE ADDITION OF " RIDGE " TO OUR PROGRAM. RIDGE IS OUR BEAUTIFUL BLUE TRI MALE STRAIGHT FROM CALIFORNIA FROM THE LINEAGE OF SHRINKABLE'S BLUE MOON (THE FIRST EVER BLUE TRI PRODUCER). 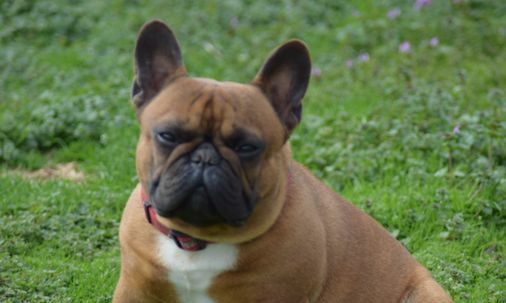 RIDGE IS A GREAT REPRESENTATION OF THE BREED AND OFFERS A DEFINITE MANLY APPEAL. HE HAS RECENTLY PRODUCED SOME OUTSTANDING PUPPIES PICTURED ON OUR AVAILABLE PUPPIES PAGE. GET THEM WHILE THEY LAST. 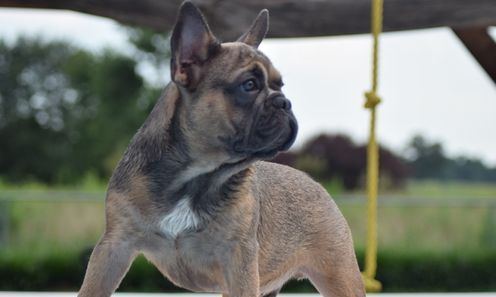 RYDER IS AN AKC RED TONED BLUE / BLUE CARRIER STEMMING FROM HUNGARIAN CHAMPIONSHIP LINEAGE. HE WEIGHS 18 LBS. 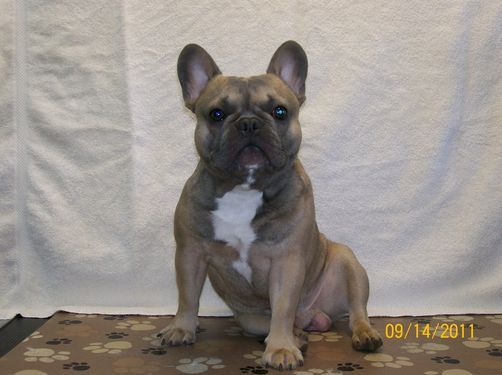 AND HAS A GREAT TEMPERAMENT AND DISPOSITION WHICH AID HIM AS BEING A GREAT REPRESENTATION OF THE BREED. HE IS AKC DNA CERTIFIED. HE IS THE FATHER OF PARIS, LONDON AND COURTNEY. CHIEF IS AN AWESOME REPRESENTATION OF THE BREED AS WELL. HE IS RED WITH A WHITE BLAZE AND WEIGHS 20 LBS. HE PACKS AN AWESOME PEDIGREE AS A DUAL CHAMPION BRED HUNGARIAN IMPORT FROM BREEDER OF THE YEAR 2013. HE IS AKC DNA CERTIFIED. NAMED BY MY SON, HE DELIVERS IN EVERY ASPECT. WE ARE BLESSED TO HAVE HIM AS SUCH A LOVING ADDITION TO OUR HOME AS ARE OUR OTHER COMPANIONS. CHIEF IS A TRUE ATTENTION GETTER AND HE LIKES A LITTLE HIMSELF. 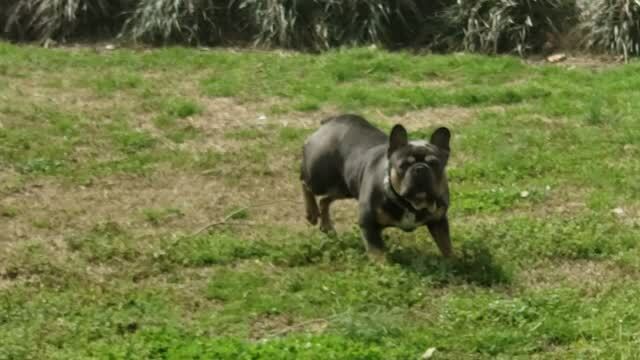 HE HAS PRODUCED SOME AWESOME FRENCHIE BABIES AS YOU CAN SEE YOURSELF. HALO IS OUR NEWEST ADDITION TO OUR FAMILY AND PROGRAM. 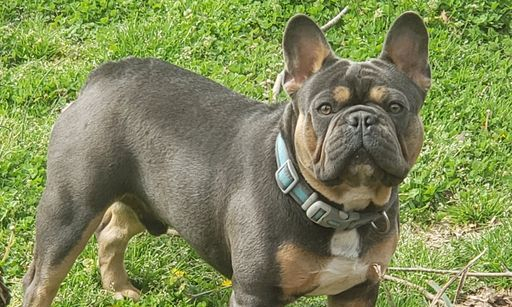 HE IS BLUE FAWN AND ALREADY EXHIBITING WHAT WE BELIEVE TO BE SOME OUTSTANDING TRAITS WHICH WE BELIEVE WILL LEND HIM TO BEING AN AWESOME REPRESENTATION OF THE BREED. PLEASE STAY IN TOUCH AS WE HOPE HE WILL SOON BE PRODUCING SOME GREAT PUPS THAT WILL TUG AT PEOPLES HEARTS AS HE HAS OURS.